in a Dili, East Timor WTP. Chemical. Our commissioning services test the water and/or wastewater treatment capabilities of our customers' water systems. We conduct quantitative analyses to determine the correct chemical dosage levels for influent water. We monitor the treatment capabilities of the system by simulating actual operating conditions. Mechanical/Electrical. We ensure that pumps, piping systems and connections are configured correctly and free of leaks when placed under operating pressures. 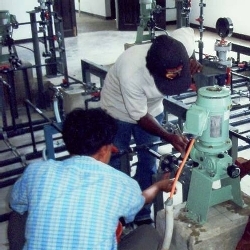 Pumps are checked to verify their operation at capacities in accordance with design specifications. We verify that electrical monitoring and control systems are functioning properly. For complex instrumentation, such as that found in SCADA systems, we check that signals between remote and central control units are relayed and integrated properly.